Most of our information about the topography of the dense clouds covering Venus' surface was obtained by the Soviet space probe missions Venera 15 and 16 and by the American Pioneer Venus and Magellan spacecraft during the period 1978 to 1994. Today we have good information about 98 percent of the surface. 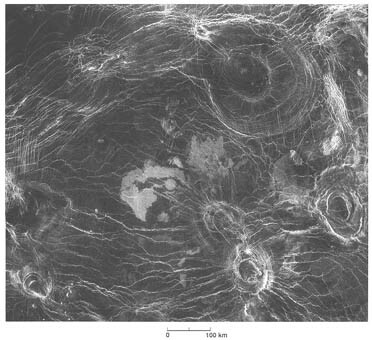 Radar mapping reveals a varied terrain on the surface of Venus: mountains, plains, high plateaus, canyons, volcanoes, ridges, and impact craters. Overall, Venus looks fairly flat. Elevation differences vary little, only 2 to 3 km, except for a few highland regions. The continents rise to only some 10 km, compared to a 25-km difference on Mars and a 20-km one on the Earth. Only some 10 percent of the surface extends above 10 km. In contrast, about 30 percent of the Earth's surface rises over 10 km (from the bottom of the ocean basins). As there are no oceans on Venus and so no reference sea level for measuring height, planetologists have taken for a reference the mean radius to the centre of the planet which correspondents to 6,051 kilometres. The surface of Venus is covered by about 20% lowland plains, 70% gently rolling uplands and lava flows, and 10% highlands. There are only two major highland areas. The largest continent, Aphrodite Terra, is close Venus' equator; its size is similar to South America. Another large continent at latitude 70°N is called Ishtar Terra. It measures some 1,000 km by 1,500 km. That is larger than the biggest highland plateau on Earth, the Himalayan plateau. This great plateau may have been built up from thin lava flows over an uplifted section of older crust. The interior of this continent is called Lakshmi Planum. Mountain ranges border Ishtar on the east, northwest, and north. One of these border ranges is called Maxwell Montes and it contains the highest regions on Venus: up to 12 kilometres - higher than Earth's Mount Everest. A volcanic cone lying near Maxwell's centre confirms volcanic activity there. 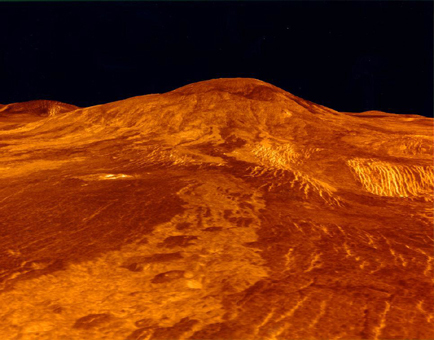 Venus has more volcanoes than any other planet in the solar system. Over 1500 major volcanoes or volcanic features are known, and there may even be a million smaller ones. Most are shield volcanoes similar to Hawaii or Olympus Mons, such as Sif Mons, but there are also many complex features. None are known to be active at present, although large variations of sulphur dioxide in the atmosphere may indicate that some volcanoes are active. More than 1000 volcanoes or volcanic centres are more than 20 kilometres wide. Unlike the Earth, volcanic features are quite evenly distributed all over the surface of Venus. Most of the surface consists of flat, volcanic plains that are imprinted by tens of thousands of volcanic domes and shields. Flat-topped volcanic features known as pancake domes are probably formed by the eruption of an extremely viscous lava. Another volcanic feature is unique to Venus. It is the corona. This feature - hundreds of kilometres across - is a circular trench surrounding an elevated plain, the diameter of which can be as big as several hundreds of kilometres. It seems to be composed of collapsed domes over large magma chambers. Coronae are possibly examples of local hot spots, mantle upwellings that have expanded and formed bulges. When the flow stopped, the bulge sank and formed a ring of mountains. Similar in form but generally smaller than coronae, and one of the more remarkable features found on Venus, are the arachnoids (spiders). As the name suggests, arachnoids are circular or ovoid features with concentric rings and a complex network of fractures extending outwards. The arachnoids range in diameter from about 50 to 230 kilometres. They may be precursors to coronae formation. There are also features that look just like rivers. Fluid lava flows have produced long, sinuous channels extending for hundreds of kilometres. One of these, nearly 7,000 km long, is called Hildr and is longer than the River Nile. 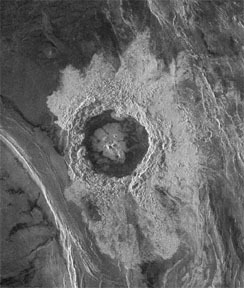 The second kind of crater which dots the surface of Venus is few in number but large in size, indicating a relatively young surface with a geological age less than 800 million years. These craters have been generated by meteor impact. Most of them are not deformed. That is another indication that the Venusian surface must be young because erosion, volcanism and tectonic forces should also affect craters. Resurfacing processes may frequently cover old craters so consequently all visible craters are young. The craters generally show central peaks, terraced walls, shocked surfaces, and flooded floors. There are no craters smaller than about 1.5 - 2 km because meteoroids are burnt up in the thick atmosphere. Although no rainfall, oceans, or strong winds exist to erode surface features, some weathering and erosion does occur. The surface is brushed by gentle winds, no stronger than a few kilometres per hour. But they are strong enough to move grains of sand, and radar images of the surface show wind streaks and sand dunes. In addition, the corrosive atmosphere probably alters rocks chemically. The Earth and Venus are almost equal in size so the interior of Venus is believed to have a metallic (iron) core about 3,000 km radius and a molten rocky mantle covering most of the planet. Unlike the Earth, Venus has a very small magnetic field apart from that induced by the effect of the solar wind. 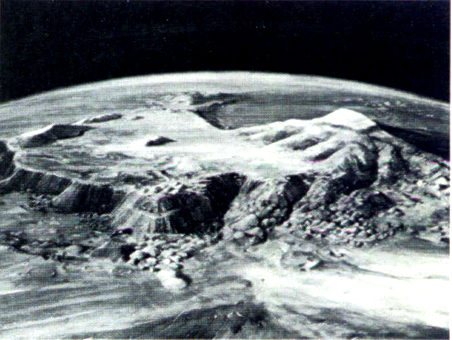 The analyses made by the Venera landers have shown that the surface material of Venus is similar to terrestrial granite and basalt. The geological history of planets and satellites is determined mainly by their age and the distribution of their surface rocks and taking into account our understanding of their internal characteristics. Like the other terrestrial worlds of the solar system, Venus is presumed to have emerged about 4.6 billion years ago by accretion of tiny objects. The primordial crust formed and was heavily bombarded and cratered. During the bombardment phase there was enough heat produced to melt the whole protoplanet. After a certain cooling period, the molten mass developed a crust, a mantle and a core. 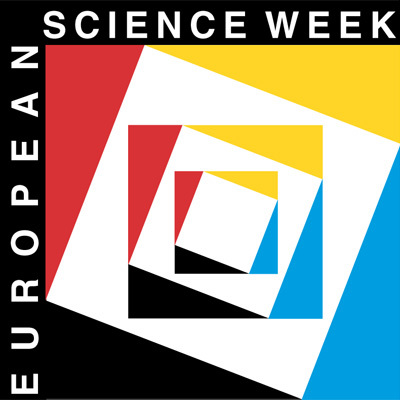 Convection in the mantle caused by internal heating (from gravitational squeezing, radio-active decay...) deformed the outer crust which is thinner in low-lying areas (corresponding to seas on the Earth) and thicker in the highlands (corresponding to continents on the Earth). High mountain regions developed by uplifting and outflowing. The Ishtar Terra mountains formed as a result of the uplift of the plateau and formation of the Maxwell mountains. Low lying areas and craters became filled with lava. The shield in the Beta Regis area was formed before the mountain ridges along the fault which broke the surface of the shield. The low number of impact craters on Venus suggests that a large area of the crust was destroyed in its early history either by lava flows, or by tectonic renewal or by sedimentary deposits. The most plausible reason appears to be covering by lava flows because there are a very large number of volcanoes, volcanic craters and lava flows on the planet's surface. 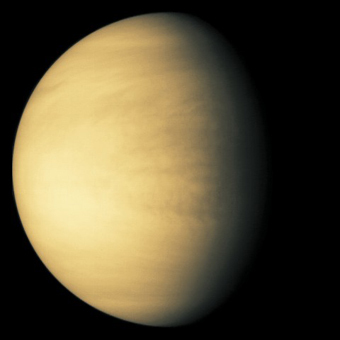 The most mysterious aspect of Venus' history is the origin of its atmosphere. It would seem that the atmospheres of the Earth and Venus should be comparable because of their other similarities. However, the atmospheres evolved in very different ways. This has led to the mild nitrogen and oxygen-rich atmosphere of the Earth and the dense carbonaceous atmosphere of Venus. So the cause of the great difference between Venus and the Earth leads back to the evolution of the oceans on our planet. Our understanding of the geological history of Venus will be fragmentary until a comprehensive global investigation is undertaken.